Today you’ll enjoy a real Aussie bush experience. You’ll head out over the Sydney Harbour Bridge and on to the Great Northern Road. 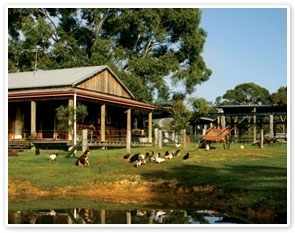 The 70 minute journey will take you through some of rural NSW and views of lush bush landscapes. Offering a truly authentic experience, Tobruk Sheep Station will immerse you into the Australian bush and life on an outback sheep station. On arrival you’ll be welcomed by stockmen on horseback and led to the nearby Drovers Camp. Once at the Drovers Camp you will be treated to traditional stockman’s tucker with billy tea and damper around the campfire. Made and served the old way – straight up – the billy tea is boiled over the campfire, while the damper dough is placed straight onto the embers. While this tucker tastes great, make sure you leave room for lunch. Now you’ll see the amazing patience and skill of the stockman at work with his sheepdog. In order to get the sheep to a particular pen on the property, the stockman directs his canine partner as it moves quickly and expertly among the 50 strong herd. With what looks like effortless skill and speed, the dog will move over, under and around the sheep to achieve his task. Have the camera ready to take a snap when the dog lands himself on the back of a wayward sheep. The age-old profession of sheep shearing requires a great deal of practice, skill and agility and here you’ll see it firsthand. While seated in the most unique shearing shed in the country, you’ll watch the shearers at work while the life of the shearer himself is unfolded. Under the guidance of a veteran, you can even try your own hand at the art of shearing an anxious sheep! After all that excitement, it’s time to enjoy some real Aussie hospitality with a mouthwatering BBQ. Today you’ll be treated to an Aussie grill of steak, sausages and burgers, freshly baked damper rolls, green salad and more. Oh, and don’t forget dessert – traditional Aussie Lamington cake – just delicious. Boomerangs were traditionally used by the Aboriginal people as a hunting weapon, but here at Tobruk they’re used for fun. Once you’ve had an expert demonstration, you can give it a go yourself – just keep an eye out for that returning Boomerang. Reckon you could crack a whip? It’s not as easy as it looks. Now our able stockmen will demonstrate the use of the whip in the mustering process. The actual cracking is achieved in a fraction of a second, by breaking the sound barrier. After the expert demonstration, why not let the stockmen show you how it’s done. Wind down with a relaxing wine tasting at Tizzana Winery. Sample its cabernet sauvignon, shiraz and muscat varieties, and well as olives, accompanied by cheese and biscuits. the boutique stores, before you return to Sydney. Hotel Pick Up: We do CBD hotel pick ups. Please select your pick up while booking online. If your hotel is not listed, then mention it in 'Special Requirements'.